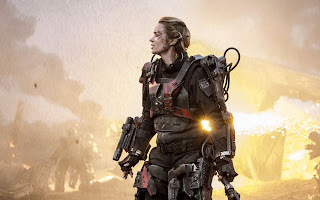 A science fiction military action film, Edge Of Tomorrow (also marketed as Live. Die. Repeat.) makes the most out of a gritty time loop battlefield premise. In the near future, Earth has been invaded by a destructive and seemingly unstoppable alien species known as the Mimics. With Europe largely occupied, a human army is assembled in England to prepare a massive counterattack, emboldened by a new exoskeleton weapons system. General Brigham (Brendan Gleeson) presses Public Affairs Officer Major Bill Cage (Tom Cruise) into covering the front line, despite Cage's lack of combat training. Very much against his will, Cage joins J Squad under the command of Master Sergeant Farell (Bill Paxton) as they prepare for the invasion on the next day. The human army is ambushed on the beaches by massive Mimic forces, and Cage duly dies, but not before spotting the famous Sergeant Rita Vrataski (Emily Blunt) in the midst of combat. During the battle Cage is splattered by the blood of a rare alien command species, giving him special powers to loop back in time, and he awakes on the previous day back in the clutches of Farell and J Squad. He repeatedly relives the massacre on the beach, trying to learn from each day's experience to influence the outcome of battle. He finally connects with Vrataski on the day before the invasion, and together they have to figure out a way to destroy the main brain behind the Mimics before Earth is annihilated. 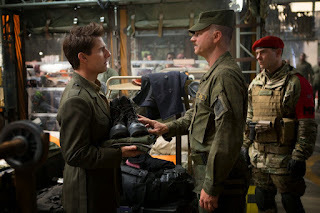 A fusion of Groundhog Day and wicked Aliens-on-Earth engaged in an existential Saving Private Ryan scale battle, Edge Of Tomorrow is an adaptation of the Hiroshi Sakurazaka book All You Need Is Kill. Directed by Doug Liman, the film contains enough human interaction between the charismatic Cage and the jaded Vrataski to infuse the action scenes with meaningful emotion. The combat setting, on the beaches of France and then pushing into the continent, is intended to bring echoes of World War Two to life, the fight against evil this time not so much about ideology but rather human survival. Edge Of Tomorrow recreates the video game experience of frequent dying, re-spawning and trying again, every attempt intended to improve forward progress by small margins. Death is no longer final, just a momentary frustration that comes with the aggravation of having to replay the familiar in order to venture a few more steps into the new. Ironically, this is the feature stripped out of game-to-movie adaptations, here embraced in a non-adaptation that capitalizes on the value of learning what does not work in order to find what does. For Vrataski, every day is new. For Cage, it will take a multitude of attempts to save Earth. He cannot succeed without failing, and his frustration and evolution into an efficient killing machine go hand in hand. In depicting this procress, Liman cleverly holds his cards close to his chest: once the premise is set, the film is often intentionally unclear until late in a scene whether events are depicting Cage's first attempt at navigating new terrain, or the umpteenth time. Less successful are the CGI-dominated action scenes. Most of the Mimics are a swirl of tentacles, and the combat scenes are frantic and fuzzy rather than fearsome. Tom Cruise is in his element as the roguish public affairs officer dealing with a new and unwelcome reality, Cruise's comfort with the more cerebral elements of action serving the film well. Emily Blunt is intense and bordering on dour, but carries the flag for feminine fighters acquiescing to no one. Edge Of Tomorrow is a breath of original air, and a breathless exercise in racing against time -- repeatedly.